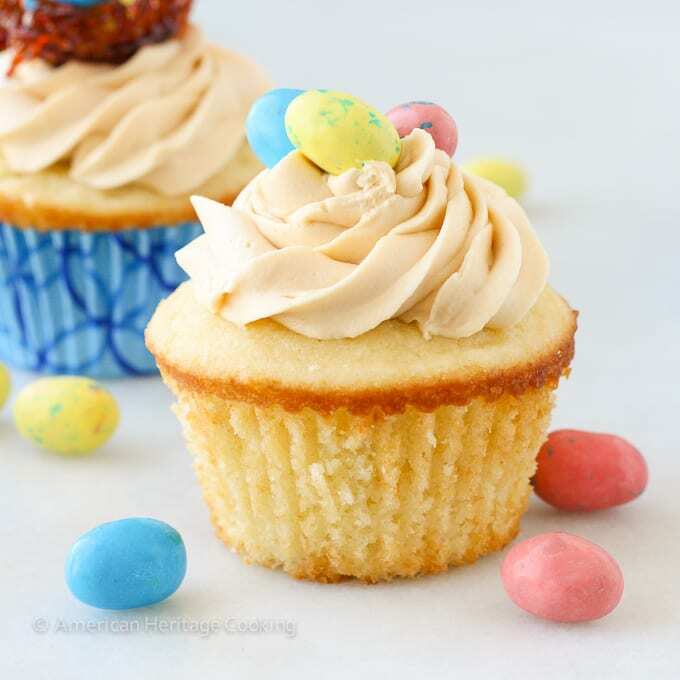 These Double Salted Caramel Cupcakes have a moist vanilla cake, salted caramel filling and a delicious caramel buttercream! For me Easter conjures up happy memories: Easter egg hunts, dark chocolate bunnies (the bigger, the better), purple sashes on giant crosses, Whopper’s Robin’s Eggs, and fancy hats. Yes, fancy hats (thanks, Mom!)! 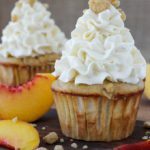 This year I can add these Double Salted Caramel Cupcakes to that list because they are fabulous! And salted caramel in cupcakes makes me happy. Actually, come to think of it, ALL salted caramel makes me happy! Recalling my happy Easter memories lead me to think about other things that make me happy. In our High School yearbook there was a page where each senior finished the sentence, “Happiness is…” While some seniors got carried away, I simply said, “Happiness is Chocolate” but I realize now that happiness is so much more than that. And finally (at least for this short list), Happiness is Salted caramel! 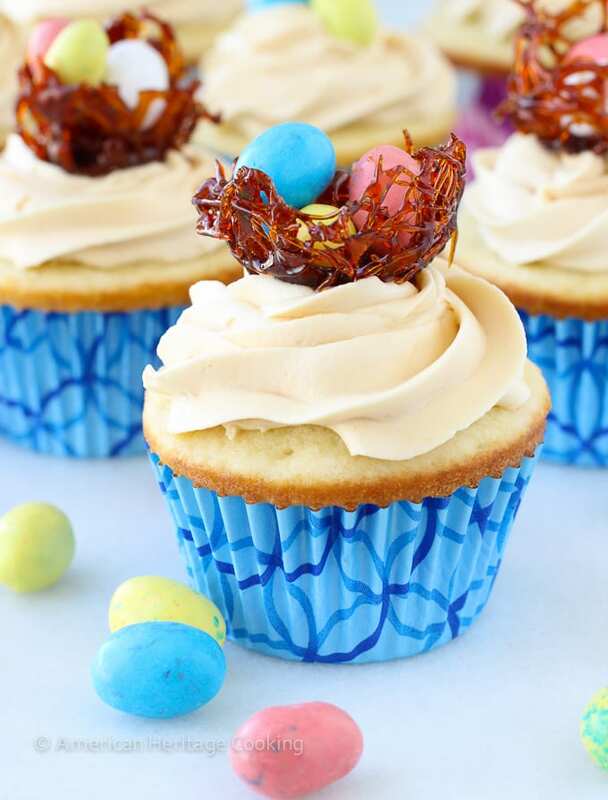 These Double Salted Caramel Cupcakes have a moist, vanilla base with a salted caramel filling and a swirl of a sweet caramel butter cream frosting. 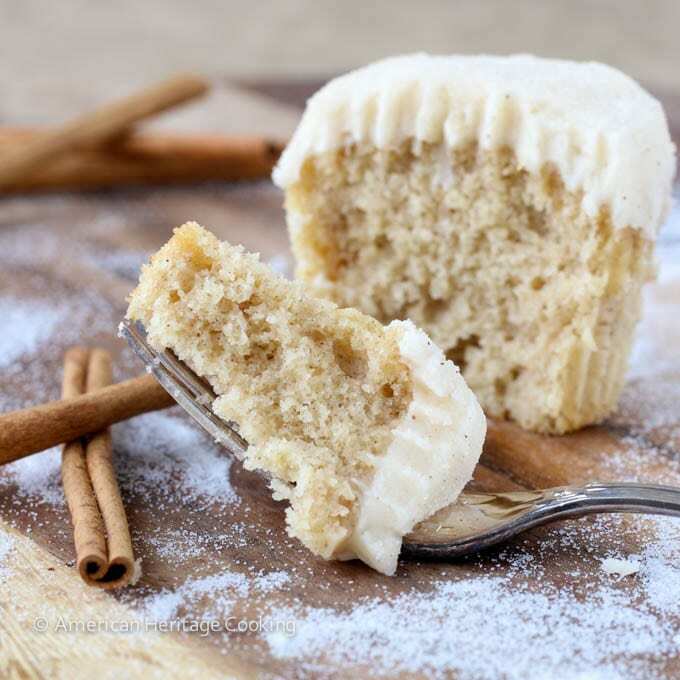 The frosting is light and fluffy and the cake is generously scented with vanilla. 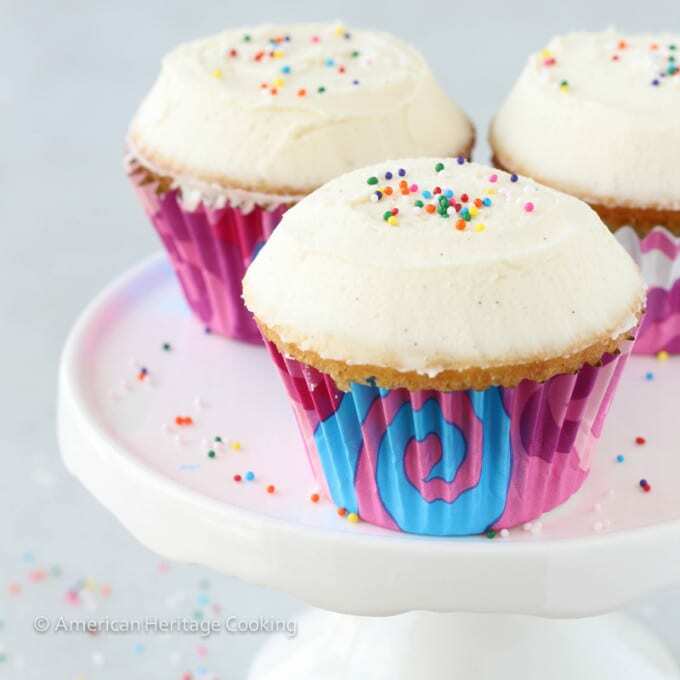 I adapted a Copycat Sprinkles Cupcake recipe for the base, so you know it’s going to be divine! 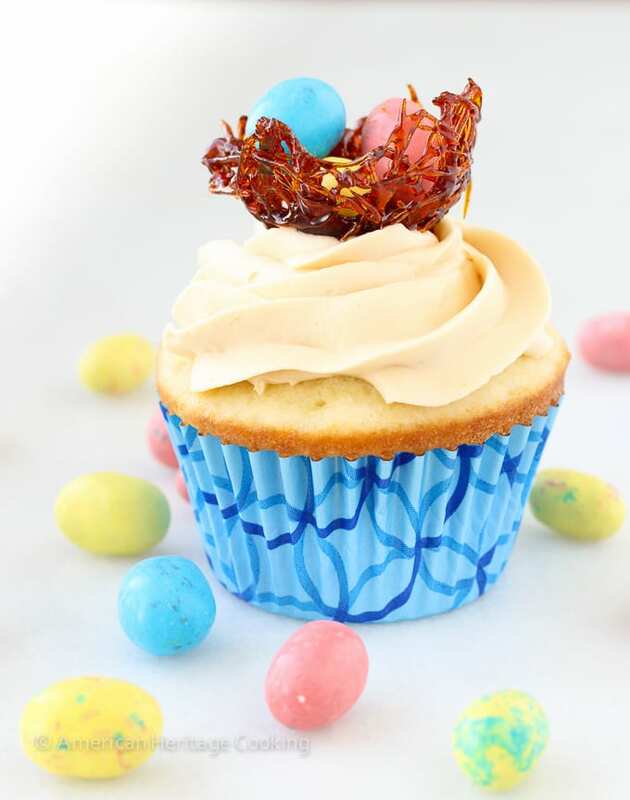 I had this vision for caramel cupcakes with adorable caramel bird’s nests on top filled with Whopper’s mini Robin’s Eggs. In reality executing on this vision was a Giant Disaster complete with 1st degree burns and a few expletives! 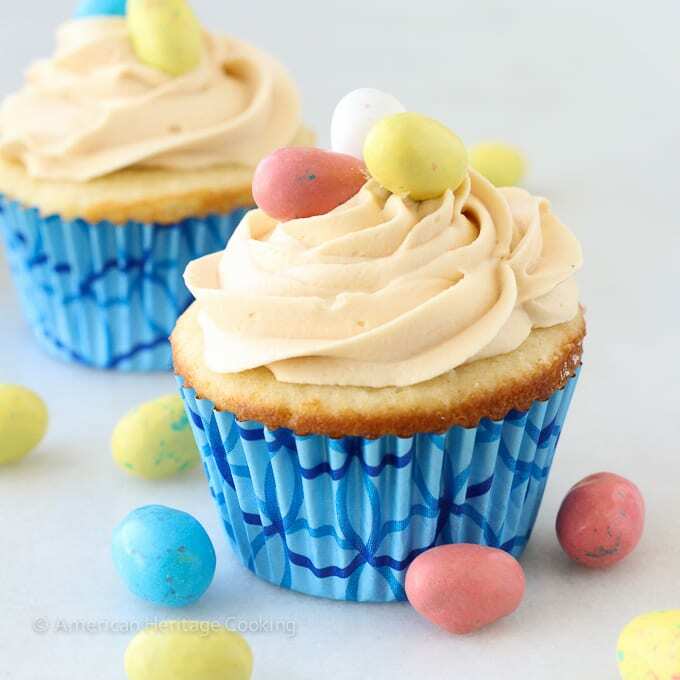 So this post is devoted to Easter, Double Salted Caramel Cupcakes and Happiness. A Salted Caramel lover's dream! 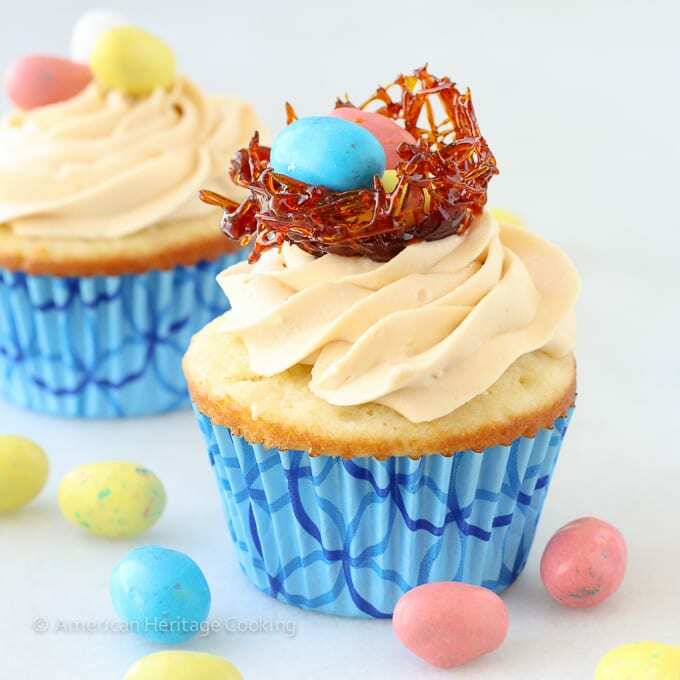 A moist vanilla cupcake is filled with the best salted caramel and topped with a rich caramel butter cream frosting! Adorably decorated for Easter!! Preheat the oven to 350°. Line 2 muffin tins with 24 cupcake liners. Sift flour, baking powder, baking soda and salt together in a medium bowl and set aside. Cream butter and sugar in the bowl of an electric mixer fitted with the paddle attachment until light and fluffy. Add the eggs one at a time, beating to combine after each addition. Add vanilla, sour cream and almond extract, beating until just combined. Reduced the mixer speed to low and stir in the flour in several additions. Remove the bowl from the mixer and stir the last bit of flour in with a spatula until just combined. Do not over mix. 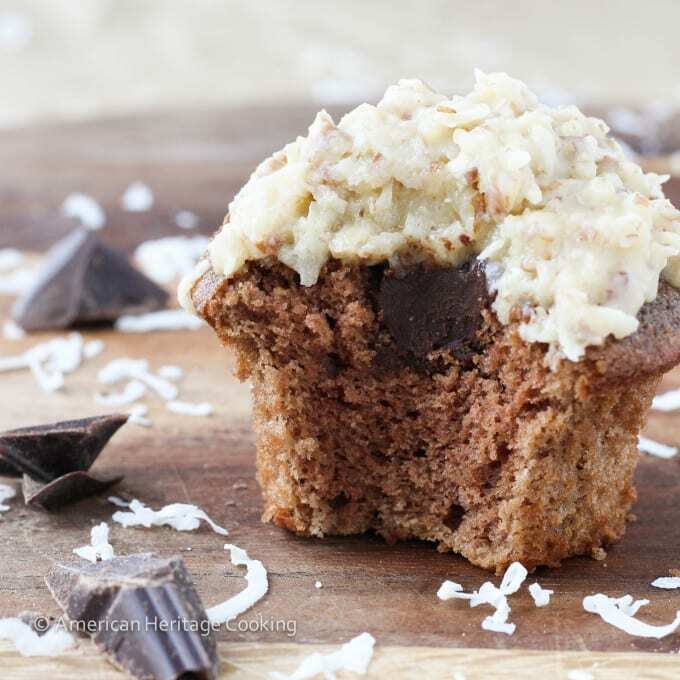 Scoop batter into cupcake liners and bake in preheated oven for 14-18 minutes or until a toothpick inserted into the center comes out with a few clinging crumbs. 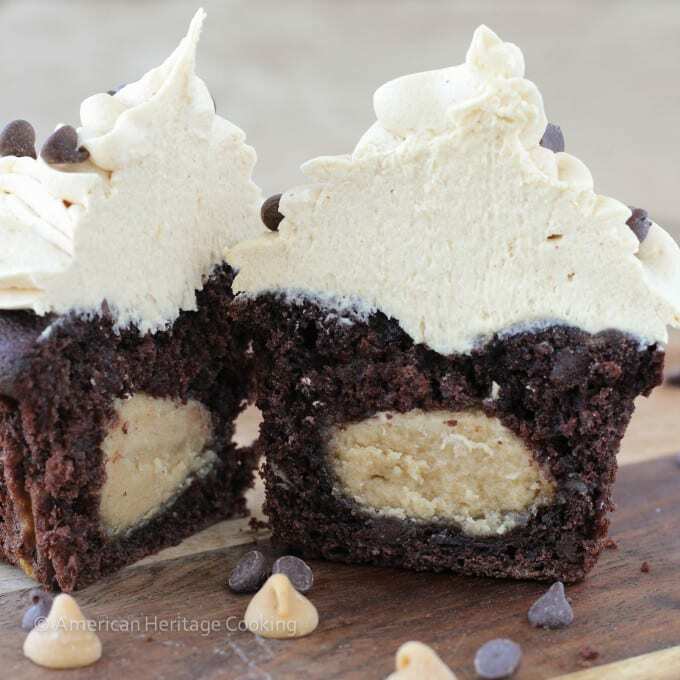 Cut a small hole in each cupcake and fill with prepared caramel sauce. In the bowl of a stand mixer fitted with the paddle attachment, cream butter and sugar on medium-high speed until combined, then add cream and continue to beat until light and fluffy. Slowly pour caramel into frosting and beat until combined. Taste as you go! Pipe or spread onto your cooled cupcakes. My nests were not edible because the caramel was burnt, but I actually quite liked the color contrast. Create hollow balls of aluminum foil, gathered at one end to form a “handle”. Place a wire cooling rack over a sheet of aluminum foil. Spray balls liberally with cooking spray. Combine 2 cups sugar and ½ cup water in a large, heavy bottomed sauce pan over medium-high heat, stirring or whisking until sugar dissolves. Cook to a hard crack (310°) over medium-high heat, swirling the pot occasionally then place pot in a large bowl of ice water to stop the cooking process. Drizzle caramel over aluminum foil balls. Place the balls on the rack using the “handle” to cool. Gently crush aluminum foil and pull out. You and I have SO much in common-I agree with all your happiness-es! And Randy is such a GENIUS!!! 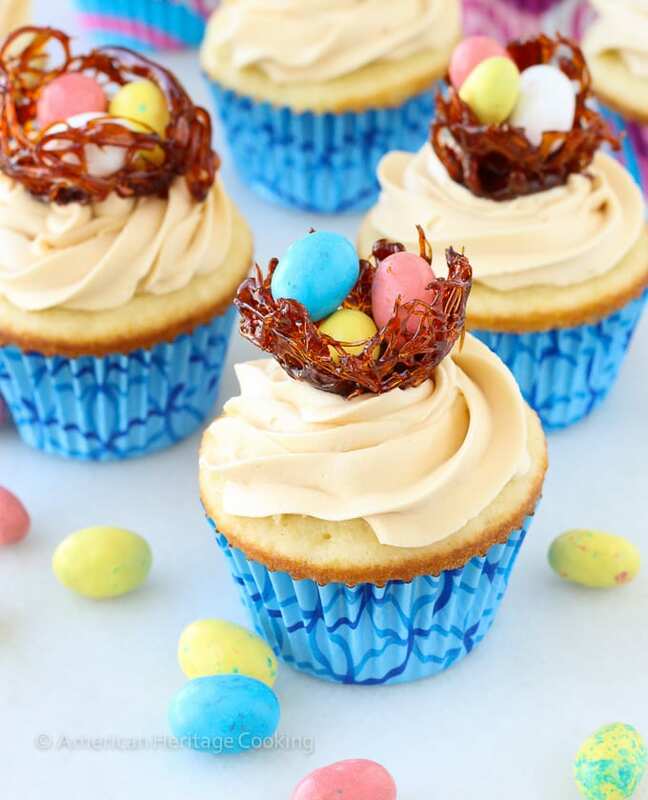 I never would have thought to turn the caramel into these adorable nests, so so sooo smart! 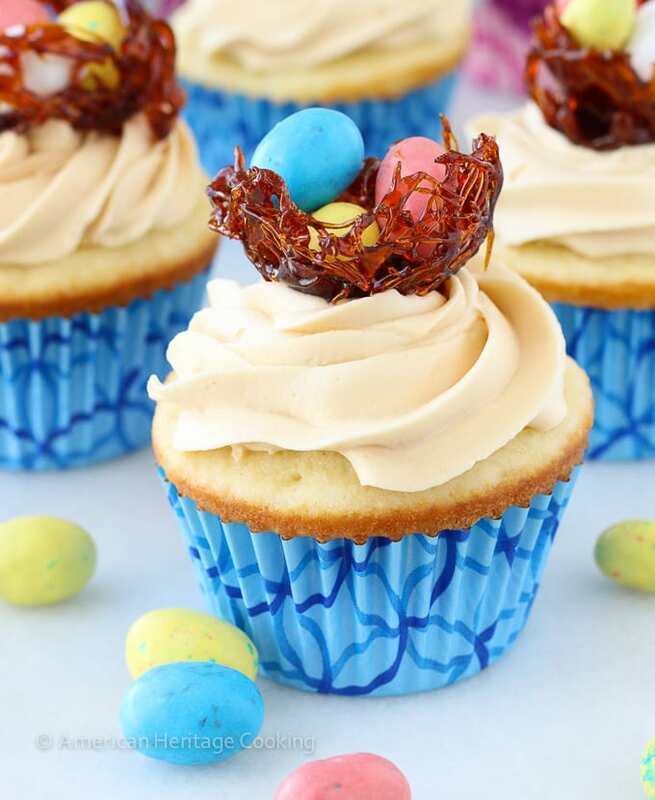 and ooooh salted caramel is my new favorite thing so these cupcakes are like AGHHHH SO GOOD! Well the caramel nests were my idea but he figured out how to create a mold that was easy to get off!!! I ALMOST brought you some, but gave up when I couldn’t figure out how to transport them without making a huge caramel mess! well then you’re both brilliant! Lol Thanks for the pin, ChiChi! My husband is amazing even if I am just a touch biased! 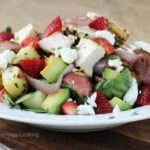 Writing this post made me smile too! 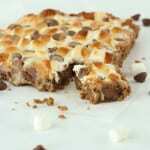 Wow these look so amazing! 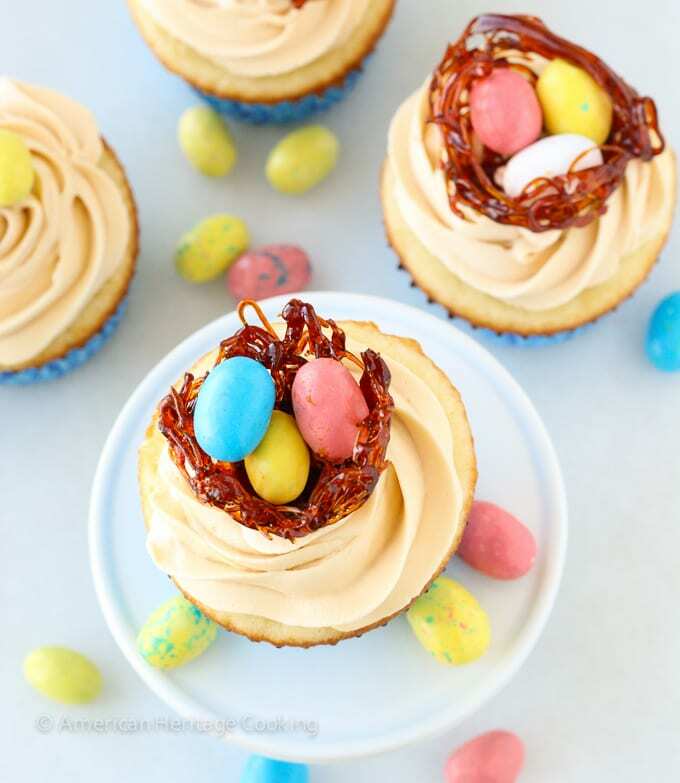 the caramel nest Idea is so creative and cute ! I love your post! Happiness is so many things from simple to extravagant. Like the first walk in a nice spring day after that awful winter, receiving a card in the mail, and flowers. Any kind of flowers. Also, these cupcakes! Oh I LOVE receiving cards in the mail!!!! Thanks, Consuelo! Any happiness list is incomplete without salted caramel! Loved this post! It sparked the happiness my afternoon haha. That is so funny and brilliant that you said Happiness is chocolate. You definitely were on the right track about chocolate, at a young age. I feel the same way about chocolate…and many of the other things you listed. You and your hubs really do sound like a great match! What a clever way to rescue your mishap and manage to turn it into something so cool. Haha it’s not every guy that can do that…some dudes just add more headache to the frustration when something goes wrong. Miss Kim @ behgopa recently posted…Love Korean food too much to ever cook in a Korean restaurant – with Kimchi Jjigae and KBBQ being a couple of things that are at the top of my list! I was planning on boiling sugar and water to a hard crack for the nests but when he suggested just using my burned caramel, I was relieved! Such a good rescue! Ah, your husband is so sweet and the bird’s nests turned out wonderfully. I saw these on Food Gawker this morning and thought they were so pretty and I was so excited to see your name beneath them! Thanks, Christin! I feel the same way when I see my foodie blogger friends on FG! Makes me happy! These are super gorgeous!!! All that caramel. And those nests!! I’m swooning. Pinned! Thanks for the pin, Dorothy!! I’m glad to know I’m not the only one who swoons over caramel! Love your salted caramel cupcakes. looks perfect for Easter table. My kids would love these. The eggs are just simple chocolate ones? Happiness is scarfing down one of these cupcakes before going back for seconds. These look amazing, and those nests are adorable. You scared to make something?! I thought I was alone out here! You can totally do it! It’s so painless. Promise. Now Swiss Meringue Butter Cream terrifies me! Am I missing something? I’m not seeing anything in the recipe about putting the caramel filling in the cupcake. Hi Tamie! Nope you aren’t. I suppose I forgot to add that step. The link the caramel I used is in the recipe but I will add instructions for filling now. Basically I cut out a little hole with a paring knife and then pour the caramel in. Then I frost them. Happy baking! I read this twice. Is there anything about the caramel filling as pictured? 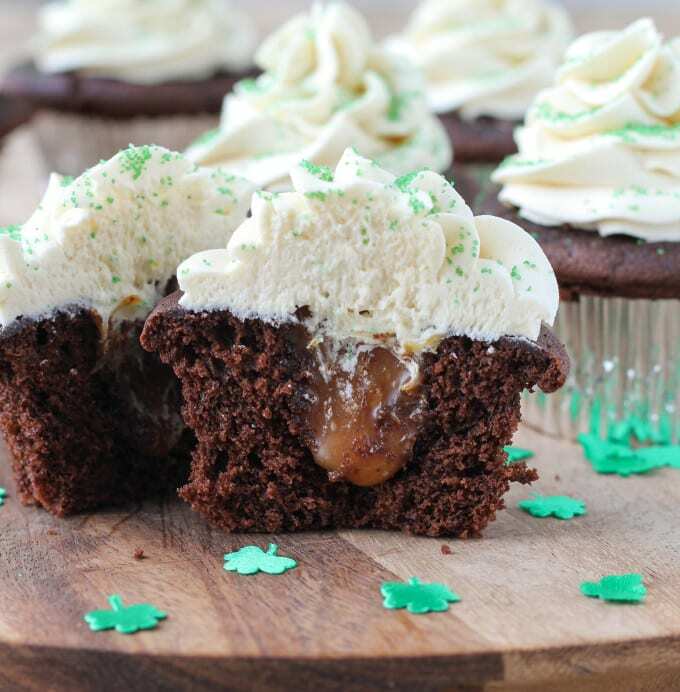 That caramel filling is just this caramel sauce recipe spooned into a little hole cut into each cupcake. Happy baking! I’ll check the recipe and make sure that is referenced.